The architects conceive architecture as a language across which properties can express themselves such as: harmony, creativity, happiness, beauty, poetry, complexity, magic, provocation and culture. In our architecture we put emphasis on the quality of the experience of living; we look for pleasure in its deepest forms, a journey through the landscape where one finds the place of thought, the refuge of the mind and the satisfaction by means of sensory and ideal declarations. We propose a journey, without scarcely moving, where space folds and multiplies. A trip across a bioclimatic architecture which looks to the immediate environment, with multiple possibilities. A trip across matter and its absence. A trip across light, and its variations. A trip across the sounds, and of the silence. This house establishes an intimate, woven and direct relationship with the topography and with the existing vegetation. In a descending promenade the diverse spaces are articulated between water courtyards and vegetation, until one approaches the great room, which in only one gesture turns into a great porch, with seamless continuity between the interior and the exterior. Every bedroom, arranged step by step, has its own exterior private space and garden, protected and intimate, and at the same time links to a common open pathway through the landscape. 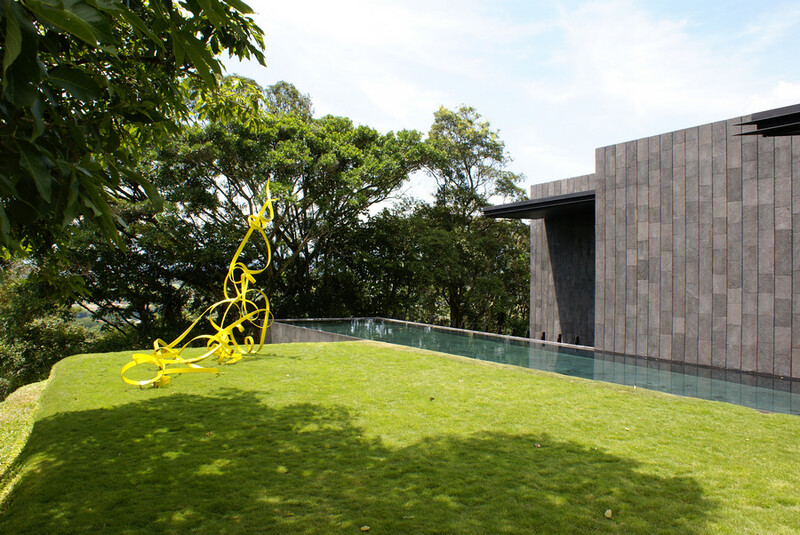 The swimming pool acts as hinge between the built space and the garden. The garden is protected from inward external views and the views of the west, with a visual horizon that allows us to appreciate the whole valley of the river Virilla, and beyond, the Tárcoles, up to the Nicoya gulf. The materials of wall, floor and ceiling will be the elements that will help to create a singular interior atmosphere, enveloping its inhabitants and to make them participants of a unique living experience.